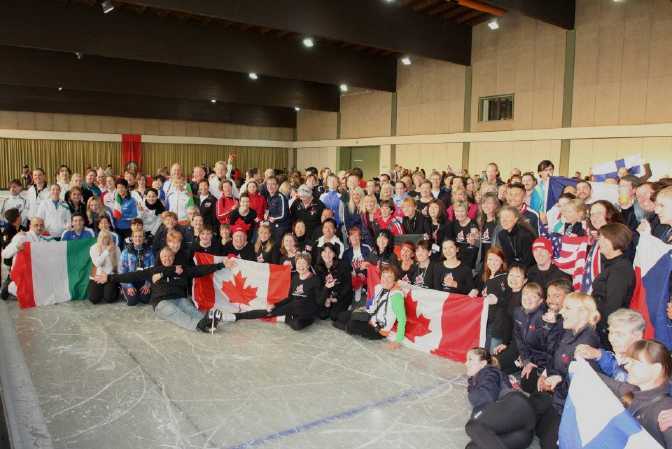 332 skaters from 23 countries came to Oberstdorf for the 9th ISU Adult Figure Skating Competition. It is, so to say, the older sister of the World Championships. Participants competed in free skating, artistic skating, pair skating, ice dance and synchronized skating. Given a sufficient number of skaters, the categories are divided into age groups in order not to have the 28-year old and the 70-year old skater competing against each other. The event has grown continiously since 2005 so that the medal ceremonies were not finished before midnight. This not only tested the staying power of the organizing team but of skaters and fans as well. For the 10th anniversary next year the event will likely be expanded time-wise. As a local, it is thrilling to see lots of skaters travelling the long way from New Zealand, Australia, Mexico, Canada, Russia and Japan. For the first time a Hawaiian skater was present this year. Here you go – the longest-trip-award. 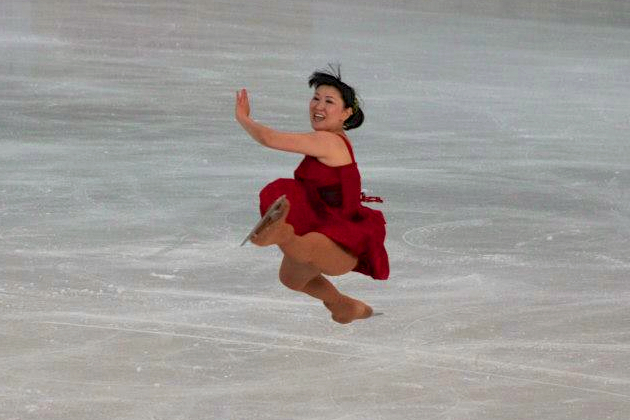 Once again the former World Champion Midori Ito took part in the 2013 ISU Adult event. Yes, THE Midori, who first landed a triple axel in 1989 in competition. She still lands a sensational double axel that is as high as Midori is tall. Thanks to the Japanese-Berlin newcomer on our team, communication with the Japanese team was fabulous. Many people mentioned how approachable and down-to-earth Midori is in spite of her being a skating headliner. Every year not only the Canadian skaters and fans inspire again and again with creative tossies that decorate the ice after each skater. Along with the official skating competition another contest is developing: who has the best tossie and who is the most persistent fan. Birgit & Joachim’s free dance was again a feast for the senses (Gold, Masters (Elite) Freedance). Georg raised a big smile even from the demanding judging panel with his extraordinary interpretation of the can-can (Gold, Masters Men II Freeskate). Felix convinced with great expression in his artistic skate (Silber, Silver Men II Artistic). Bettina was proud to be placed next to Midori Ito on the podium (2 x Silber, Masters Masters (Elite) Ladies II Freeskate + Masters Ladies I+II Artistic). Jacqueline just missed another win in her category (Silber, Bronze Ladies II). Isa overcame her nervousness this year (Bronze, Silver Ladies II Freeskate). Simone skated a beautiful program (Bronze, Bronze Ladies III Freeskate). Claudia got the highest technical mark in her category (Bronze, Silver Ladies I Freeskate). Robert pulled out a lyrical program and just barely missed a medal. He and his pairs partner Claudia were not able to skate their best in the pair skating section. If they had, they would have easily placed on the podium (6th place, pair skating). Christine is more than happy about her fifth place. Just as is Anke, who did a super job of entertaining with simple skating skills (8th place, Bronze Ladies II Artistic). Birgit R., who took part in the first ISU Adult Competition in 2005, competed in 2 events with an artistic program and a move up to silver ladies in free skating. Newcomers Ira, Nadine, Bianca und Makoto made a great debut in Oberstdorf. 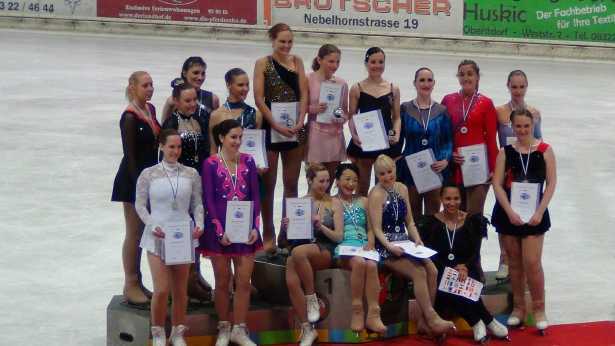 The Berlin synchronized skating team took part for the third time and achieved a wonderful 4th place among seven teams from five nations (Australia, Hungary, Czech Republic, Switzerland and Germany). As one skater was absent due to illness, the season’s best score for the „Hurts“ program was all the more remarkable. Beginning three years ago, the Paula Smart Trophy has been awarded to the best artistic program. This year Stuart Bell of the UK fully deserved to win the trophy. His performance was a skating delight. The choreo was nothing short of spectacular. As cold as the temperature can get in May in Oberstdorf, the atmosphere in the rink is warm among all the skaters. Initial hellos at the welcome party are full-throated. All are happy to meet old and new friends from near and far. What really sets adult skating apart from competitive high level skating is the mutual support and cheering for each other independent from the skatings skills. That is really great. Yet competition is taken seriously and excitement is high. Still, every skater receives recognition for his/her performance. Usually I am most touched by the lower categories and higher age classes because one senses the pure enthusiasm for skating. Adult skaters do not strive for world records but for their personal best. Given the fact of declining performance capability and the demands of every day life, adults’ skating goals are very individual. As I was in Oberstdorf for the very first time I was moved by the creative and confident programs that were skated. Perfect skating skills are not key – although helpful - for igniting a spark in the audience. Getting in touch with skaters from all over the world and sharing our passion, meeting skating stars – be it competitors or coaches – was very emotional. What touched me most was the encouragement during the competition. I received strength and support from my fellow skaters. It was a great week with lots of nice experiences and get-togethers. I was strongly impressed by the warm-hearted and motivating audience. Special thanks to the fans from Berlin/Cologne/Switzerland for their loud cheers and support and to the Canadians who tossed sweeties. I saw spectators moved to tears after performances. Thinking of that I again get goosebumps. Realising how many people I could give pleasure to with my skating is amazing. Giving my best to the audience and getting back tons of tossies is fabulous. Moreover, I loved the adult flower girls & boys (Pat & David). Oberstdorf was interesting, versatile, many great performances. I treasure Bettina’s artistic skate. I am happy about my 5th place and thank those who shared my happiness. I feel tingly about the international atmosphere, the well-run organisation combined with the professional evaluation of programs of all levels. To me that is the best of the event. It is always a pleasure to make the long trip to Oberstdorf for that wonderful experience and a training camp on-site or some vacation days. 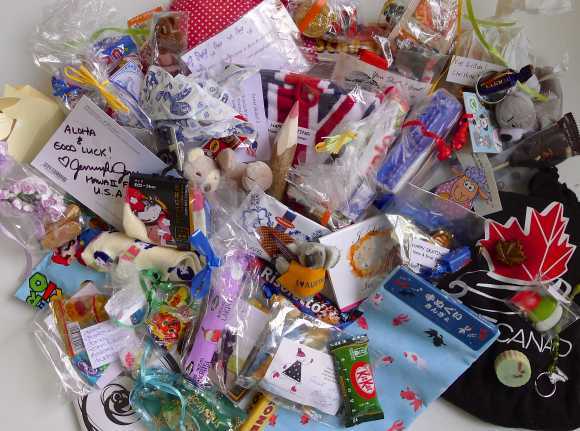 The audience in Oberstdorf helped me a lot because it cheered me up although I had some errors. For this reason I could enjoy my performance. I am most impressesd by the perfect organisation of the event. I have participated for three years now, and although it gets bigger each year, I have never experienced any major problems. The performance of Midori Ito gave me goosebumps, as did the programs of Georg and Bettina. All in all it is remarkable how many skaters come to Oberstdorf and where they all come from. Kudos to all performances that were given by every single skater. I am most touched by my first placement in the top ten, including a new personal best in Artistic. I am happy about a flawless program and had lots of fun with my routine, although it’s too bad that this event took place with just a few spectators. However, those who were present cheered a lot. How often does it happen among the audience that one is laughing till one is crying? It did happen to Hana Conor (UK) whilst Axel Rinaldi was skating. Not all of us have the perfect skating physique or the best skating age. When, regardless of that, the enthusiasm of the spectators for men V (age group 68 years +) or pair skating is as strong as for skaters with a competitive background, I still get goosebumps. What moved me the most was our support for each other. Everyone was there, when time allowed, for the other skaters' programs and loudly cheered them on. I was also touched by the many small gifts that were thrown on the ice, some of which were very creative and showed a lot of thought. All the performances were unique. Isa impressed me the most with her beautifully calm and elegant skating. It was a surprising moment and gave me goosebumps. I was also very happy with Christine's and Anke's improved skating and placement (Artistic). Before this event I was thinking that adult skaters could learn a lot from competitive skaters, but that is not true. It is exact the opposite. The artistic side, the joy and the passion for skating along with the cooperation and good-will among all competitors – I haven’t experienced that so far in any other competition. 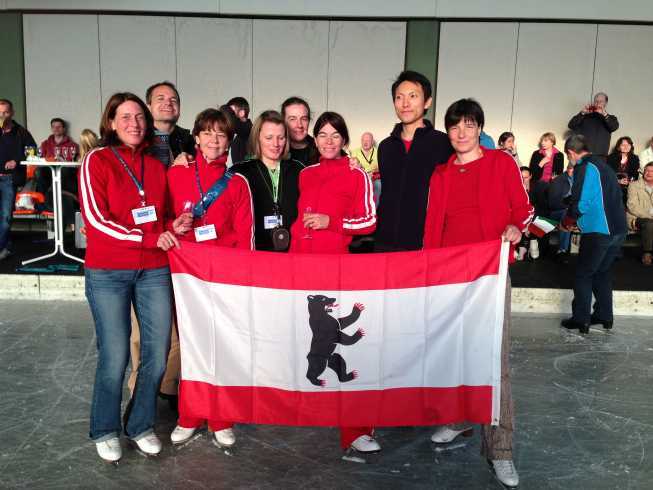 Even though this was my first appearance in adult skating, I felt part of the German team. Thanks. It was wonderful.